This Saturday the 26th of May, the Vikings Premier Division teams will take on Royals, while the ViQueens will face the Gungahlin Eagles. All games will be held at Viking Park. Monday the 28th of May is Reconciliation Day, which is a dedicated opportunity for Australians to reflect upon reconciliation as well as to celebrate Aboriginal and Torres Strait Islander peoples, cultures and history. Vikings Rugby will be hosting a Welcome to Country Ceremony to celebrate Reconciliation Day prior to 1st Grade’s kick off. The ceremony will include a speech, smoke and music, as well as the debut of a traditional painting commissioned by acclaimed artist Casey Gough. 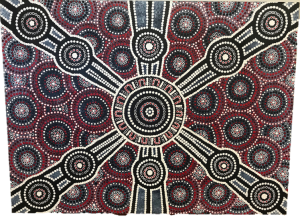 Casey’s painting will be auctioned off at our annual Sportsman’s Luncheon, with proceeds going towards assisting indigenous Vikings rugby players. 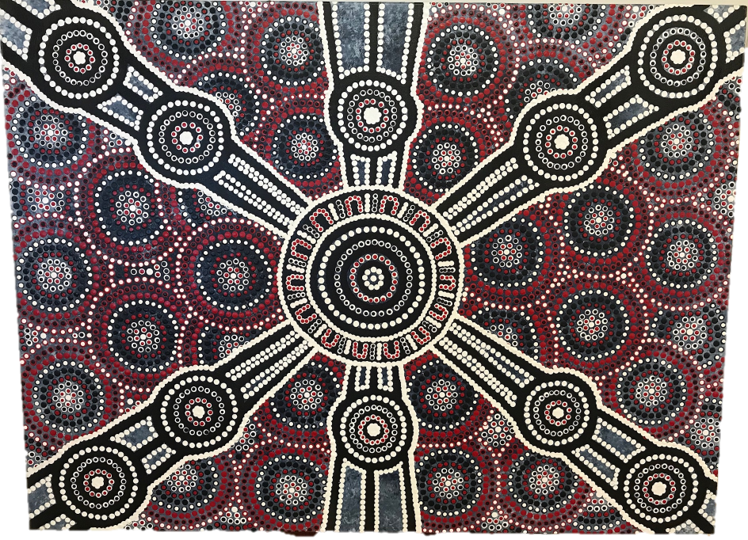 You can preview Casey’s painting below – it signifies ‘travelling to one significant meeting place’, using Vikings Rugby colours, red, white and black. Be sure to get down to Viking Park from 3:00pm and be a part of this significant event!